Cigniti is recognized as a Strong Performer in Forrester Wave™ for Continuous Testing Service Providers, Q3 2017. 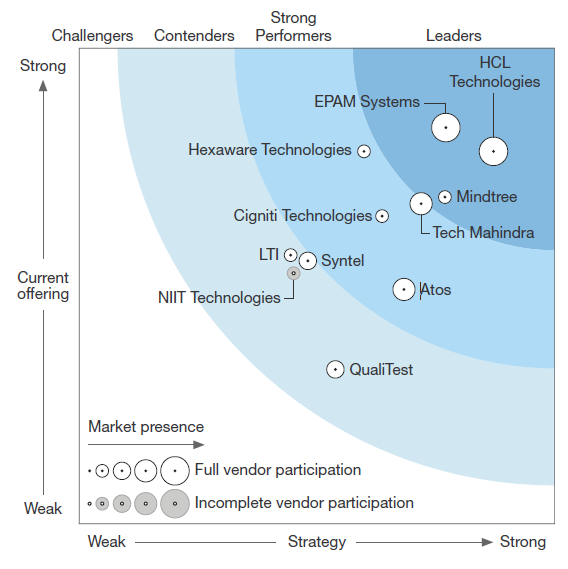 It is among the top three global vendors for clients looking for independent and pure-play CT services focused on Agile & DevOps. Cigniti Technologies differentiates its pure-play CT services with a DevOps focus. Cigniti Technologies, an India-based provider of pure-play testing services with a growing presence in the US and UK, is rapidly maturing its Agile and DevOps CT services. Cigniti stands out for its IP investments in BlueSwan, a comprehensive testing services platform accelerator; in Liqe, a US testing client community growing globally; and in an innovative, machine-learning-powered tool for analyzing user experience for the airline industry. These, coupled with Cigniti’s strong, diverse engineering skills and its DevOps consulting capabilities, support Cigniti in its shift. The vendor also has solid client programs, methods, and frameworks for CT transformation consulting. It provides a breadth of CT practices and services with points of excellence in test execution automation, test environment provisioning, and testing in production.